The tremendous myopia of the human race is an ironic thing. How can a single specie, so self-centered and self-indulgent, possibly have any effect on the remaining 30 million species that share the planet with it? You'd think the others would go unnoticed, wouldn't you? Well if the one specie manages to impact global ecology through toxic refuse, exploitation of natural resources, breeding animals for food, forcing dependencies on organic fuels, developing weapons for mass destruction, deforestation, pillaging the sea for its resources, wrapping the globe in electromagnetic fields, following its xenophobic reaction to any kind of competition, it can indeed change, affect or endanger its less empirical brothers who, through some trick of Fate, manage their respective journey from cradle/egg/cocoon/larvae/bulb/bud/seed-to-grave without the benefits of a Hammurabi law-giver, holy book, Home Owners' Association, lawyer, legal permit, corporation, or Holy Dispensation. Whew! --long sentence! When the one specie unconsciously or consciously deploys itself around a defenseless geographic feature (better known as a natural resource), the resource is pretty much doomed, along with any other specie that happens to live in a state of delicate balance with it. Sometimes it's the other way around --the defenseless specie is surrounded and harvested and the geographic feature suffers from its absence. At any rate, the polymer of relationship ensures that no single thing is isolated from the effect of mankind's self-serving actions. The technology-challenged ancestors of modern man were perfectly capable of devastating an environment. They just lacked the means of inflicting wholesale and lasting damage. Some cultures, insulated and autonomous, still managed to avoid long history lines by acts of nearsightedness, as occurred on Easter Island (Rapa Nui), for example. Their agenda was leavened by the same ingredients we heap on our own activities. In the face of modern technologies our planet has now shrunk to Rapa Nui stature. Destructive priests and natives are now called Multinational Corporations and governments. A hand axe has become a nuclear power plant or the fishing industry's factory ships. An ancient village fire is now an annual conflagration of 3 million hectares in the Amazon Basin. Buffalo Jumps have become factory farming and slaughterhouses. 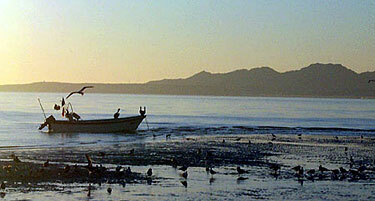 The Sea of Cortez is just another natural resource falling under the flailing-sticks of modern economics. As far as this beautiful area is concerned, tourism is just a euphemism for terrorism. Shrimp boats, sports fishing, hotel and boat sewage and festival garbage embraced by tides all take their toll. Below are a few links that speak to this problem. PDF article or go to the original site.